Traffic lights PowerPoint templates, backgrounds Presentation slides, PPT Themes and Graphics. Educate your neighborhoods about the road Signs using our Traffic lights PowerPoint templates. 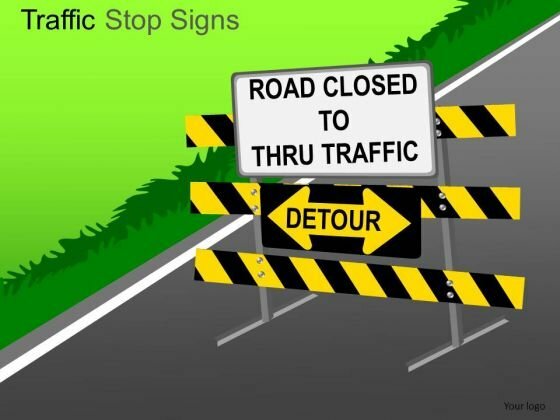 You can use different traffic color signs as a metaphor for various business solutions. 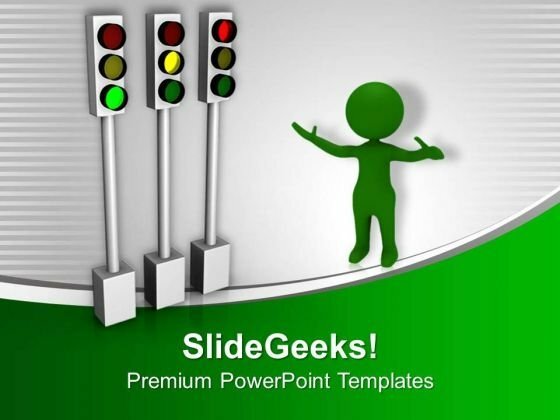 We also have a selection of free traffic lights PowerPoint templates in our free section. SlideGeeks is one-stop-shop for all professionally designed and fully editable road signs templates and traffic lights diagrams. Illustrate the meaning of various traffic rules for new drivers with our road symbols and signs. Our traffic rules templates are also effective graphics for business presentations to show the speed and progress of different company projects, the ones that have been stopped and given the red signal, the ones currently on hold depicted by amber light, and the ones that have been the given the go ahead or the green signal by the management. Marketing and sales professionals can also use highway signs such as end, innovation, creativity, etc. to illustrate different aspects of their sales pitch. Download our construction warning signs such as construction ahead and men at work sign to present your business slides in a unique and interesting style. 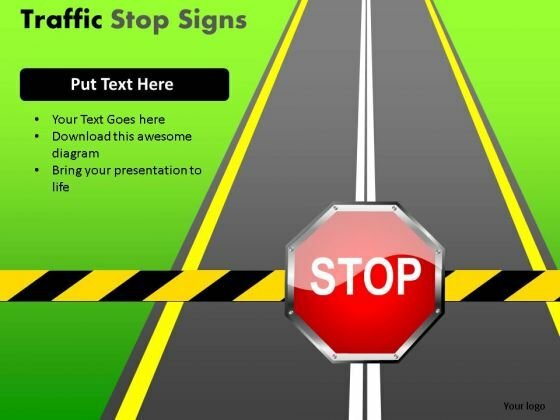 Looking for traffic themes or traffic signals backgrounds for your upcoming presentation? 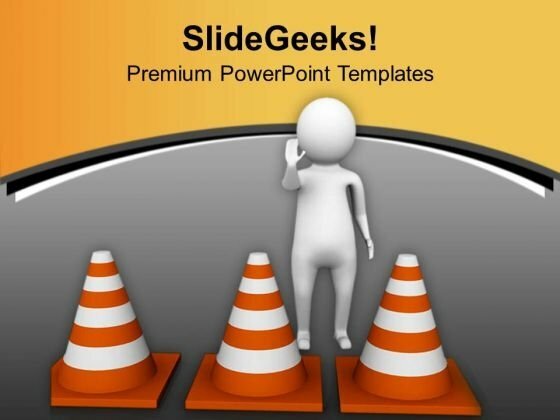 Find handpicked presentation themes on traffic rules to create a professional presentation. The red, amber and green lights are universal metaphors that can be employed in business presentations too. You can highlight if the green signal has been given to your business proposal or a project has been halted which can be indicated by the red stop sign. 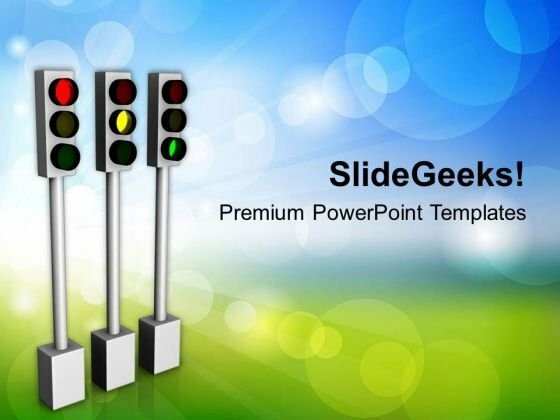 Traffic light PowerPoint theme will make your presentation interesting and easily understandable for the audience.